Fortunately for me, our journalism delagation tour here in Turkey also includes a look at art history & traditions. So naturally, a visit to a rug shop was in order. Our friend and delegation leader, Resul, arranged for us to meet with Tayfun Kaya, owner of Caravanserail Carpets and Jewelry in the city of Kusadasi, and his assistant, Mustafa. Mr. Kaya and Mustafa have been in the carpet business their entire lives, same as their fathers and grandfathers before them, and work seven days a week. After this educational tour, I now understand how my mother returned from Turkey last year with not one, but three gorgeous rugs, and only a vague notion of how it happened. Our meeting began with Turkish coffee, baklava, and a brief demo & explanation of the long tradition of carpet making in this region. The silk industry purportedly came to Turkey in the 12th century when Byzantine monks smuggled silk worms back from China. 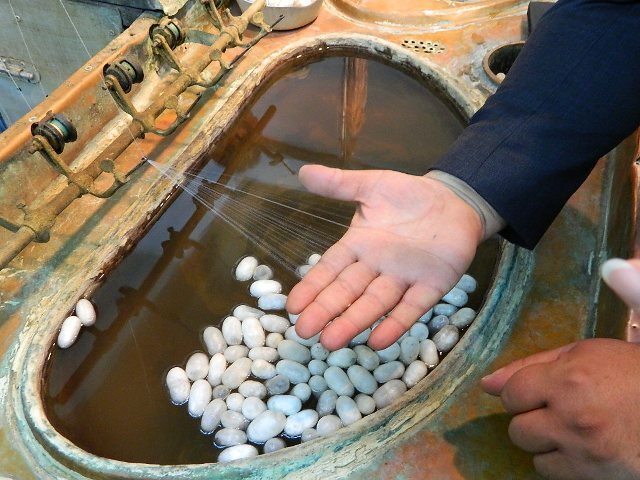 These days, Turkey is the second largest silk producer in the world, right after China. Silk is the second strongest naturally-occurring fiber, with spider web being the first. Each cocoon spun by a silk worm is a single strand, approximately one and a half miles long (!). 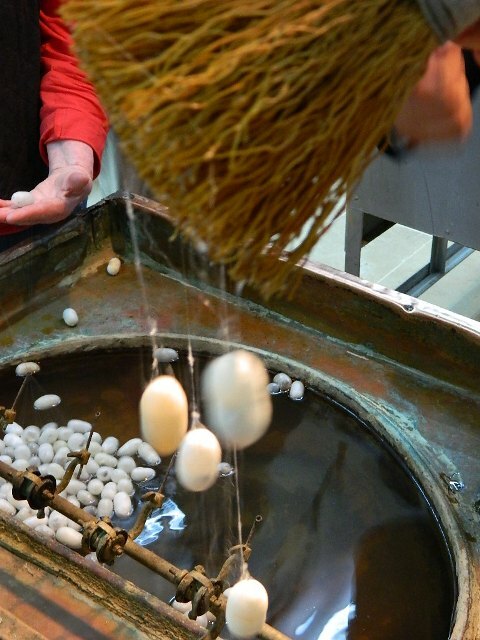 To harvest the silk, the cocoons are boiled with the worm inside; if the worm were taken out first, the strand would be broken. A broom is used to grab the fibers after the cocoons are boiled. Thirty-five fibers are spun together to create one silk strand. Turkey considers their silk to be superior to China’s because they grow only white worms that eat only mulberry leaves, while the Chinese grow a large proportion of yellow worms that consume the entire mulberry tree (less expensive to grow). 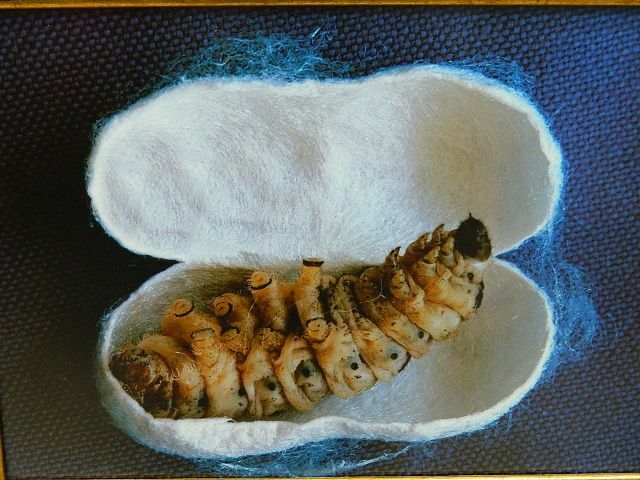 Most of the silk worms in Turkey are grown in the Bursa region, not far from Istanbul. 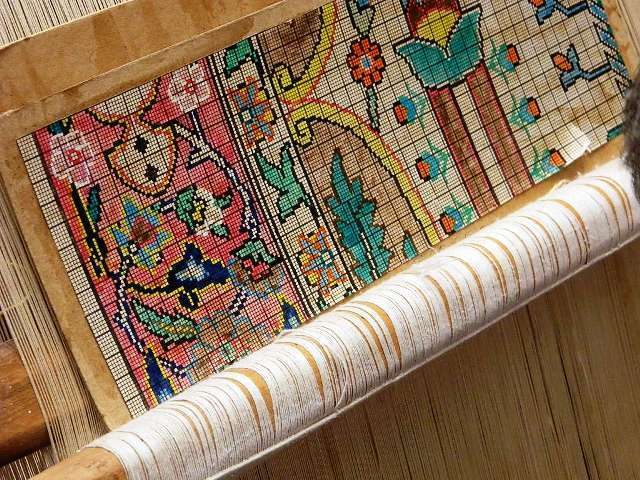 Turkish carpets are composed of various warp/weft combinations: wool/wool; cotton/wool; cotton/silk; or silk/silk. 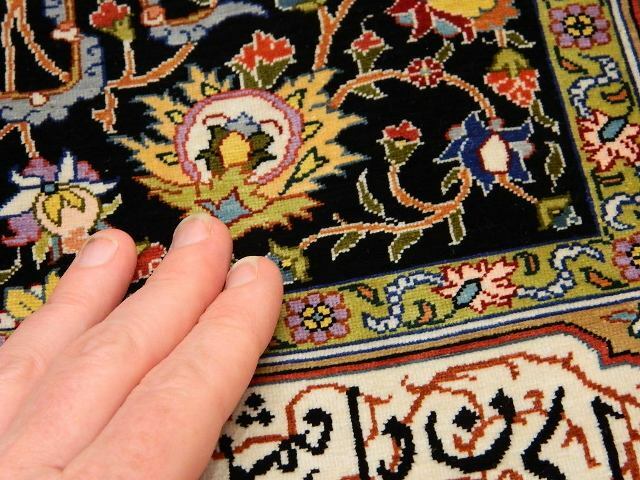 The rugs are hand-woven on looms by women using the double knot technique. Following the pattern, colored threads are looped around two weft strands in sort of a pretzel pattern, and tied tightly. Then the threads are combed down and trimmed. 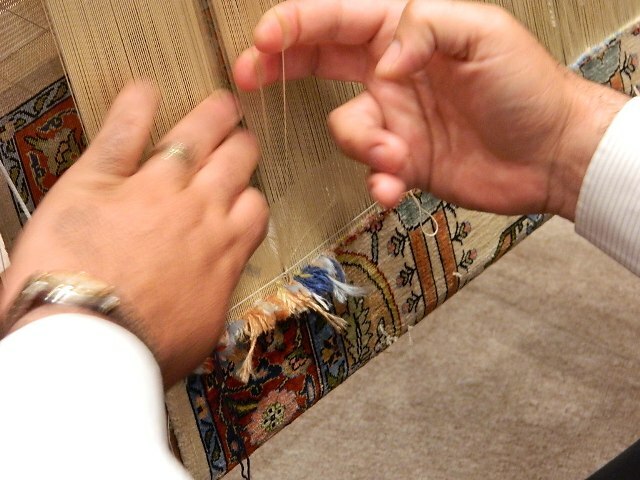 Turkish rugs are priced according to the number of knots per-square-inch only (not size), because obviously, the higher the knot count, the more time and expertise that has been invested. Knots per-square-inch range from 24 (very rough) to over 4,000. The finest designs can be created only in silk, with anywhere from 450-4,000 knots psi. The knots are the main difference between handmade and machine-made rugs, the latter of which uses glue to adhere fibers to the warp. Glued fibers eventually rub off, while knots become stronger with use. The average lifespan of a handmade Turkish rug is 100-200 years or more, depending on the quality. The Guiness World Record holder handmade rug was woven by a renowned carpet making family in Anatolia with a stunning 5,000 knots psi. Tayfun explained that the rug was purchased by a Japanese buyer, but Turkey later regretted the sale and felt it should be kept here as a national treasure. A representative from Turkey flew to Japan and offered the buyer twice what he had paid, but the man refused to sell. 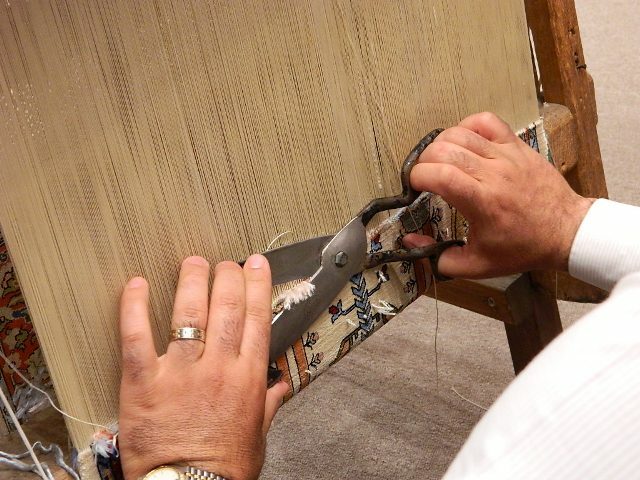 There is now a rug under construction by the same family with 5081 knots psi so that Turkey will once again possess the world’s finest handmade rug. Actually, you just reminded me. I bought FOUR, yes FOUR rugs on our first trip to Turkey. I think I will go roll out that runner right now. The two rugs I bought from Tayfun in April arrive this week delivered by one of his agents. Like you mother, I don’t know exactly how this happened, but I fell under his spell and the beauty of the rugs. He is married to an American woman and my father and I spent a wonderful time having lunch and talking with him after the sale. Hi Bejoy, you can read a little bit about the region where my rug was purchased in this post (toward the bottom) https://liveclay.wordpress.com/2011/05/22/i-cant-believe-i-bought-a-turkish-rug/ and see a picture of it here https://liveclay.wordpress.com/2011/06/25/turkish-rug-has-arrived/. When I get home today, I will look on the certificate to see iif there is a more specific name for this kind of rug. I am really happy with it. My mom also purchased a silk/cotton rug, and a cotton/cotton, and she is also happy. Amazing! I’m the in market for one in Dubai and overwhelmed by the whole process (choosing one, bargaining, finding a reliable store, etc.) Also considering a trip to Turkey…. Hi longhornsandcamels! Yes, the rug purchasing was very intimidating and not something I would do without some knowledge about the products & process. We were lucky–on this trip to Turkey we were taken only to reputable establishments. Even so, the Turks are freaking great salesmen. it’s BEAUTIFUL, Laura…..and colors are fabulous!